Current Transformer Equivalent Circuit Model Part 2a: CT Burden. In part 1 of the series, we talked about the Excitation current and Excitation impedance of a Current Transformer equivalent circuit model. In part 2a of the series, we shall explain some additional parameters, like the burden, winding resistance, and the Leakage reactance in much greater detail. So, let’s look at the equivalent circuit model of a current transformer. In Part 2a, we are going to focus on the CT burden. The CT burden is the load which the impedance of the relay and CT leads are connected to the CT secondary terminal. It is generally represented by “ZB” and expressed as VA (volt-ampere) or Ohms (Ω). This CT Burden is independent of the current being produced in the CT secondary winding. Now, the CT Burden plays an important role and must always be present when the CT is being used. If there is no burden that’s present, this is similar to an OPEN CT condition or an open circuit CT condition, this is where a large voltage will build up across the secondary winding terminals and there will be no magnetic field which opposes the primary side magnetic field and this will cause the CT to get saturated prematurely and will produce extremely high voltage magnitudes on the CT terminals which is extremely dangerous. So the CT Burden must always be present. -ve plus Is times the (Rs + Xl) plus Vb equals to Zero. The ‘Rs’ is the winding impedance of the CT itself and Xl represents the leakage reactance which is often neglected. Now, we know that the voltage across the excitation burden or the burden. Now, we know that the voltage across the excitation branch is equal to Ie time Ze, which is the excitation current times the excitation impedance, so equation can be rewritten as, Vb, which is the voltage across the burden equals Ie time Ze minus Is times (Rs + Xl). We can easily see that when the voltage across the CT burden is low, the excitation current is also low – meaning that the voltage across the burden and the excitation current which is considered to be the CT error – are proportional. On the other hand, if we keep on adding more burden to the secondary CT, then the flux (excitation current) in the CT core will also increase. This is as per the excitation curve discussed in the previous part of this series. Now, keep in mind, that the “Burden” is an important factor while designing a CT. 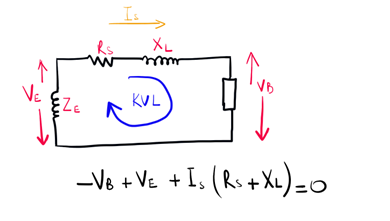 The voltage across the burden equals the voltage across the excitation branch minus Is times the (Rs + Xl). A large CT burden causes an increase in the secondary terminal voltage (Vs) and relatively increases the excitation current (IE). The more the excitation current, the more the CT is likely to saturate. So let me repeat, the more the excitation current, which is the current that is going through The excitation branch, the more the CT is likely to saturate, which is a big problem. Now the CT burden is an important parameter for power system protection. Protection Engineers need to make sure that the CT can handle the worst-case fault condition. Furthermore, protection engineers must make sure to calculate all the aggregate burden impedance. That’s basically anything that is connected to the CT secondary terminal which includes cables going to the relays, the actual relay impedance/burden, terminal block impedance which is very very low (almost negligible), meters, the return cable and so forth. Designs of the past which is like 20, 30, 40, 50 years ago, we had multiple mechanical, electromechanical relays wired to a single CT. There may have been multiple relays for phase protection and ground protection connected to a single CT. Now, these relays really had a high burden because they were electro mechanical and they had a huge coil that was used to operate the contacts. So it was extremely important to calculate the aggregate CT burden. Today, with microprocessor-based relays, we have eliminated multiple relays connected to a single CT. In part 2b, we will discuss the CT resistance and leakage parameters in much greater detail. We hope this topic and series is enjoyable and enlightening for students and professionals. If you find this content useful, please consider subscribing to GeneralPac.com… Making Power Systems Intuitive.